So why isn’t Iowa (6-4, 3-4 Big Ten) getting Fant the ball more? It is a perplexing question in an increasingly disappointing season in Iowa City. The issue came to a head last week in a 14-10 loss to Northwestern, Iowa’s third straight defeat after a 6-1 start. Fant, the team leader with six touchdown catches, had just one catch for zero yards as the Hawkeyes let its final chance to remain alive in the Big Ten West race slip away. It was the fourth straight game without a TD grab by Fant. The Hawkeyes head to Illinois (4-6, 2-5) on Saturday looking to resurrect its season and Fant’s role in their offense, especially considering he might leave for the NFL. “We’ll try to keep him involved and get him involved. But he’s a good football player. We’re going to be a better team if we can get him the ball,” Ferentz said of Fant. Hockenson has been excellent, with 39 catches for 615 yards and five total TDs. But Fant’s 18 career touchdown receptions are the best in school history for a tight end and the third-most in that category in Big Ten history. Fant is also considered a possible early-round pick in the 2019 NFL draft, should he choose to leave school early. Iowa rarely has such talent at a skill position, which only makes it more confusing as to why the Hawkeyes haven’t found more creative ways to throw the ball Fant’s way. 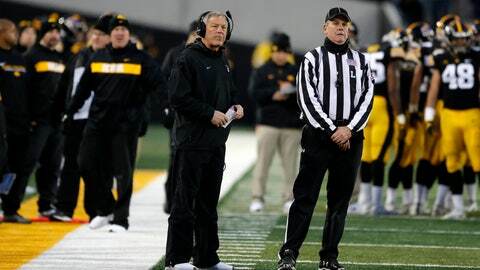 Ferentz dismissed the notion that something is going on with Fant away from the field. Iowa is a 16-point favorite against an Illinois team allowing nearly 40 points a game. But the Black Friday finale against Nebraska could end up being a referendum on the Hawkeyes’ season.